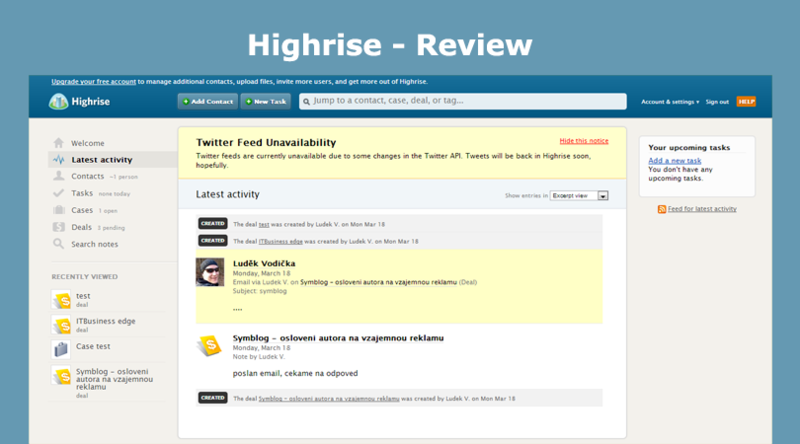 Highrise CRM is the best application for managing your business related customers and contacts if you own a small business. It is one of the best CRM software for small business, non-profit organization along with freelancers as it provides a central database to keep all of your information regarding your customers with your notes and emails with them. 1. It allows you to keep and organize your various notes and email conversations of up to 30,000 customers as well as contacts, which suites the requirement of small business. 2. It also helps in tracking various business deals and different proposals. 3. It also provides you the ability to share status updates regarding your project or provides the ability to deal with the sales team or the entire company. 4. It also provides import data from Microsoft Outlook, Basecamp accounts, vCards, etc. It comes with hundreds of add-ons which can assist you efficiently to do your business. 5. It also keeps track of your various calls along with emails and notes, follow-ups and also the tasks related to your customers as well as your sales team. It provides a home base for everyone who is associated with your business. It provides a smarter way to keep tabs on your customer relationships. 6. You can also track leads and deals along with pending sales leads, different proposals with our closed deals or any unsuccessful projects. 7. It provides easier synchronization of contacts from Microsoft Outlook and Excel. 8. It has sufficient space for storing meeting notes. 9. It also provides swift document and contract management along with efficient contact management. 10. It comes with effective proposal and deal tracking. 11. With its mobile friendly interface, you can easily access contacts via your Android phone or an iPhone. 12. It also helps in keeping task management within the team. 13. It also keeps tracking of employees reviews. 1. It also acts as your personal assistant. While using this software, your various contacts and communication history can easily be shared across your team or in any case, with the entire company which keeps everyone on the same page. 2. Its email management is quite a great feature as it allows you to access your emails via this software and you can easily import or export your email contacts. You can also create one web-based contact book which can be utilized by your entire business. 3. It also allows you to send instant reminders using email, or SMS, which helps you in managing and meeting important client calls. 4. It enables you to review your different conversations, calls, meetings along with customer relationship, which comes quite handy to deal with your customers and managing your business. Its account is quite safe and secure and comes with password protection. It is good application only for small and medium sized business as it allows you to organize the notes and email conversation for only 30,000 customers which isn’t sufficient for large business. This software is quite a great tool when it comes to managing the customer relationship and various communications made with them. This allows you to keep a tab on your small business customers along with keeping everyone in your company on the same page because of its sharing features. With its live support and email based support, you can easily get answers to your queries related to this software. So, in case you decide to use this software, then do let us know about your experience. Also, mention your views in the comment section below.